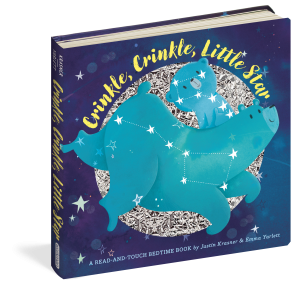 Every year Good Reads With Ronna selects a variety of gift books we think will make everyone in the family happy to receive. 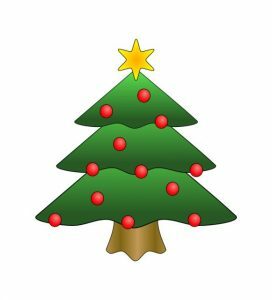 We hope you find something here or in one of our Christmas book roundups that will please a family member or friend this holiday season. We’ve all at one time looked up at the sky at night and wished on the first star. Maybe it brought back the memory of the childhood song, Twinkle, Twinkle, Little Star. Perhaps as we got a bit older, someone pointed out the Big Dipper (Ursa Major), the Little Dipper (Ursa Minor), or even Orion’s Belt, and a sense of wonderment came over us. 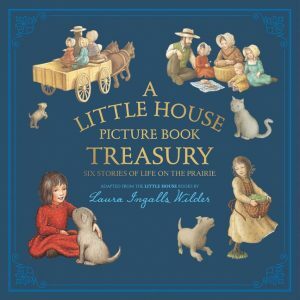 Adapted from the Little House Books by Laura Ingalls Wilder, this collection of My First Little House Books is beautifully packaged as A Little House Picture Book Treasury. What a perfect introduction to the beloved stories so many of us know from either the long running television show or from the popular book series we read as children. Christmas is a great time to share the stories with the next generation who will be enchanted by tales from Wilder’s childhood in 19th century America. What a clever and easy new way to enjoy reading together with your kids! 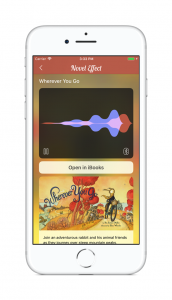 Using the Novel Effect app adds another layer of interactiveness to enhance the story time experience. Music and sounds follow along as you read out loud from your favorite kid’s books. Getting started is easy. 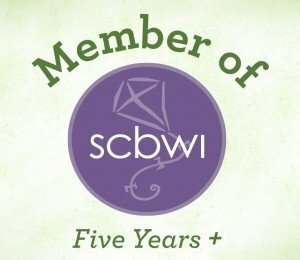 I know because I’ve downloaded the free app and tried several of the stories I was provided to sample as a reviewer including Dream Animals: A Bedtime Journey by Emily Winfield Martin. I found the experience quite magical. I just have to wait to be grandmother to take advantage of it. Here’s how it works. First download the free app, watch the video and then try out the sample story included. After that you can go ahead and choose a book from Novel Effect’s library or use the search feature to find the book you want to read. “Be sure to have your own copy of the book ready to go!” Once you’ve chosen your book’s cover image, you simply tap “Read Book.” A new black box will appear at the top of your screen. You should see lines in this box squiggle, indicating the system can hear you. “Now you are ready to read your physical book out loud (you do not have to hit any buttons),” says Novel Effect CMO Carmela Orsini, Esq. “Our technology will respond to what you read with sound effects and music, based on what words/where you are in the book, so feel free to jump around in the story!” That was really the most amazing part of this technology and it worked beautifully. For a really immersive experience, the company recommends using bluetooth speakers to help make you feel like you’re in the story. 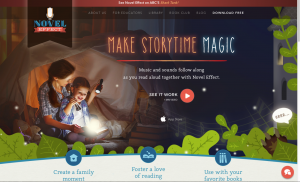 According to Orsini, the Novel Effect app works with physical or e-books, and they’ve built an impressive library of books that many families and schools already have on their shelf (as well as some fun new titles to explore). 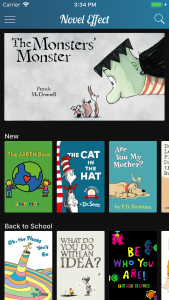 “However,” adds Orsini, “we do include three free e-books in the app so that everyone can enjoy reading with us even without a book.” Those are The Tale of Peter Rabbit , The Night Before Christmas, and The Tale of Benjamin Bunny. 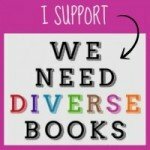 Novel Effect currently has plans to expand these free e-book offerings through their existing publisher partnerships and by adding additional public domain titles. Novel Effect has partnered with well known publishing companies including Hachette Book Group, and well-known authors like Todd Parr, R. L. Stine, Ame Dyckman and Jane Yolen in a library that includes over 100 titles to charm even the pickiest of readers. In addition to availability on the iPhone, use the app with iPad, and iPod Touch from the App Store. From Anchorage to Washington, D.C. and lots more in-between, 50 Cities of the U.S.A. is a feast for the eyes and intellect of any map and facts fan. This delightful book is a terrific new addition from the team that created the best-seller, The 50 States. In 112 colorful pages packed with over 2,000 facts, Balkan takes us across the country in alphabetical rather than geographical order. Not a page from the end papers onwards is wasted when there is so much info to impart. Starting with the helpful two page introduction which explains how to use the book, it’s easy to see why young readers will be inspired to return again and again to discover more interesting details about these cities. The book is unique in that it focuses on many different aspects of a city, from streets, neighborhoods, inspiring people, industries, experiences and nature spots. “We want this book to be the key that unlocks the door of your imagination, and makes you curious to travel further.” I particularly like the brief Welcome box provided for each city and love that it offers names of books to read that were written by city natives or take place there. 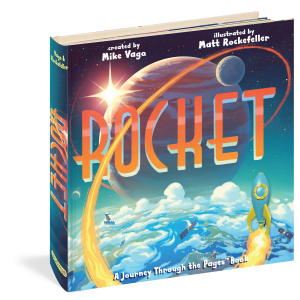 The back matter features several pages of additional cities to visit, an index, a resource guide and a cool Can You Find spread to test your observation skills. 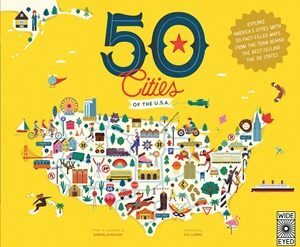 While 50 Cities of the U.S.A. is a children’s book, adults will no doubt find it fun to get lost in the pages as well. 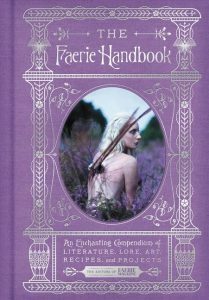 This stunning anthology appropriately covered in purple with silver accents will appeal to long time faerie lovers as well as anyone seeking to connect for the first time with their inner faerie. The 240 silver-edged pages are divided up into four parts: Flora & Fauna, Fashion & Beauty, Arts & Culture, and Home, Food & Entertaining. User friendly, The Faerie Handbook can be read in order, section by section, or according to one’s fancy. The artwork alone makes this book gift worthy so that when coupled with the captivating content, it’s a treasure to truly cherish! Be sure to put a bookplate in your copy if you plan to lend it to a friend. Its very presence is enticing and you want to be sure it gets returned. 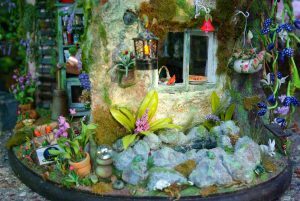 Curious about fairy clothing, fairy houses, or how to make a fairy terrarium, fairy dust, fairy crown, or fairy tea cakes and tarts? It’s all in here. 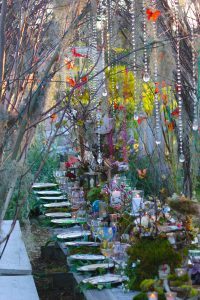 Wondering how and where to find faeries? That’s in here, too. In fact A Gardener’s Guide to Fairy Husbandry and also Fairy Portals and Pathways were two of my favorite chapters. When we lived in London, my daughter would leave notes for the faeries in our garden and on many occasions she would receive notes back from them, written in a golden script on gossamer-like paper. Maybe woodland creatures who interact with faeries intrigue you or perhaps you want to learn more about various fairy legends? Well, the editors of Faerie Magazine will not let you down. I definitely could have used this book when planning my wedding, especially since all kinds of edible flowers were explained and that’s something unique I wanted to serve to guests. As a Cicely Mary Barker Flower Fairy devotee, I chose to have nasturtium appetizers at my reception. The centerpieces were Victorian-style topiaries, suitable accommodations for even the most discriminating of faeries. 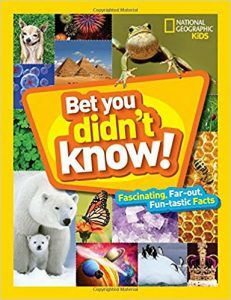 The 50 States Fun Fact Blog Extravaganza! 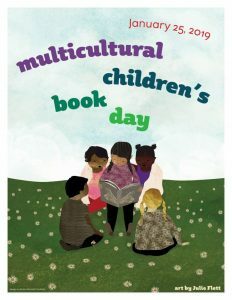 Ages 7-10, Blog Tour, Juvenile Nonfiction, People & Places, U.S.A. 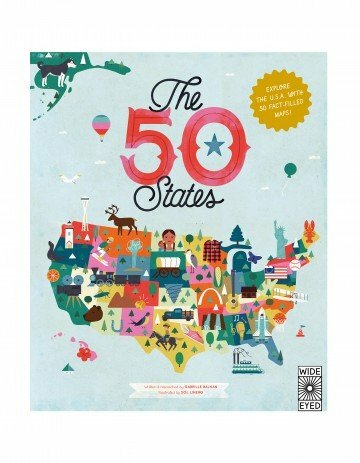 Upon reading The 50 States, a lavishly-illustrated collection of fact-filled maps, children will be inspired by the inventiveness, beauty and diversity of the United States. There are thousands of wondrous locations to be explored, hundreds of historical moments to discover, and The 50 States: Explore the U.S.A. with 50 fact-filled maps! also includes information on hundreds of people who helped make America what it is today. In addition, there’s a helpful guide to the state flags and presidents of the USA. And we’ve got New York!! WELCOME TO THE EMPIRE STATE New York was America’s capital before it was a nation, and still a British colony. After the Americans won their independence, George Washington—the first president—was sworn in on the steps of New York City’s Federal Hall. With a population of more than 8 million, New York City is the largest city by far in the country. In fact, “the City that Never Sleeps” has more people than 40 of the U.S.’s 50 states! This mighty metropolis is one of the only places where the price of a slice of pizza and the cost of a single ride on the subway have been equal for over 50 years! One visit is all it takes to fall in love with this historic, culture-filled state—from the jaw-dropping awesomeness of Niagara Falls or the rugged beauty of the Adirondacks to the cheesecake, hot dogs, and clam chowder of the Big Apple. 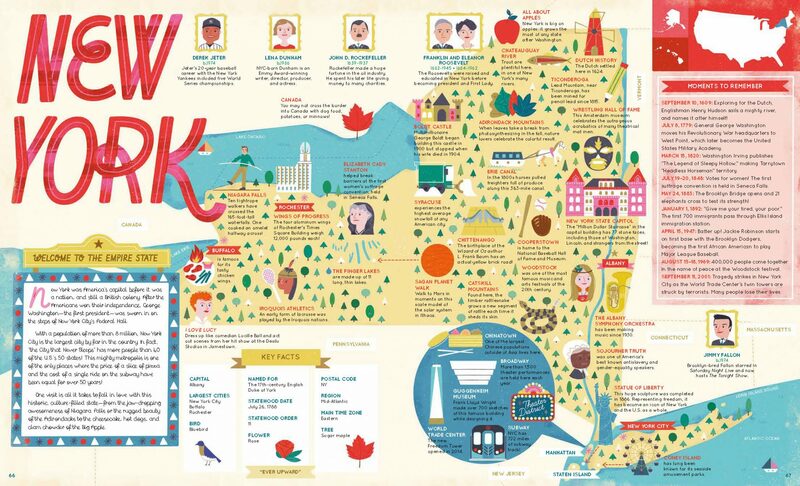 Interior artwork from The 50 States: Explore the U.S.A. with 50 fact-filled maps! by Gabrielle Balkan with illustrations by Sol Linero, Wide Eyed Editions ©2015. – DEREK JETER b.1974 Jeter’s 20-year baseball career with the New York Yankees included five World Series championships. – JIMMY FALLON b.1974 Brooklyn-bred Fallon starred in Saturday Night Live and now hosts The Tonight Show. – JULY 8, 1779: General George Washington moves his Revolutionary War headquarters to West Point, which later becomes the United States Military Academy. – JULY 19–20, 1848: Votes for women! The first suffrage convention is held in Seneca Falls. – MAY 24, 1883: The Brooklyn Bridge opens and 21 elephants cross to test its strength! – AUGUST 15–18, 1969: 400,000 people come together in the name of peace at the Woodstock festival. – New York is big on apples: it grows the most of any state after Washington. – Dress up like comedian Lucille Ball and act out scenes from her hit show at the Desilu Studios in Jamestown. – STATUE OF LIBERTY – This huge sculpture was completed in 1886. Representing freedom, it has become an icon of New York and the U.S. as a whole. – SUBWAY NYC has 722 miles of subway track! – THE FINGER LAKES are made up of 11 long, thin lakes. – SYRACUSE experiences the highest average snowfall of any American city. – IROQUOIS ATHLETICS – An early form of lacrosse was played by the Iroquois nations. Find out more by picking up a copy at your local independent bookstore today.